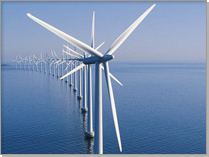 Complete wind power solutions for onshore, offshore and service projects, wind power plant construction and operations to deliver clean wind powered electricity to customers alike. As demand for clean power generation to meet the world's growing energy need increases, Bankset Energy Wind Power has the answers. With highly efficient, robust and reliable wind turbines, Bankset Energy has a demonstrated history in delivering proven solutions to onshore, coastal and offshore sites. Bankset Energy's Wind Power's service team is dedicated to keeping the turbines running optimally throughout their entire life cycle. Bankset Energy also offers integrated solutions and services that meet the demands of the entire wind energy conversion chain. 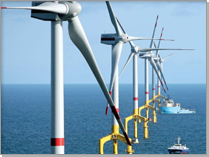 In 2012 Bankset Energy has begun testing the new Siemens 154 m rotor for the 6- megawatt (MW) offshore wind turbine in Denmark. The SWT-6.0-154 turbine is equipped with the world's longest rotor blades – each blade is 75 meters in length. With a record rotor diameter of 154 meters, each SWT-6.0-154 turbine can produce 25 million kilowatt hours of clean electricity in offshore locations, enough to supply 6,000 households. As early as May 2011, Siemens installed the first prototype of its new 6-MW turbine using a 120 m rotor. It has now been operating successfully for well over a year. The serial version of the 6-MW turbine will use the 154 m rotor and is expected to become the new benchmark in the offshore wind industry.